Paella is, among authentic Spanish recipes, the most international of all. It’s the best known and also the most desired in the world. But there’s nobody like the Spanish themselves to explain what is paella and what paella isn’t, because the boundaries are very narrow but highly significant between the strict concept of paella, and other recipes with rice like seafood rice. Being rigorous, we have to say that the authentic paella is the paella valenciana, for which there are some ingredients clearly permitted by the restaurateurs and experts in gastronomy in Valencia, Spain. It’s a chicken paella that, in addition to chicken, is made with rabbit and other ingredients such as tomato, garrofo beans (a type of Lima bean), green beans, saffron, extra virgin olive oil, water, and salt. The authentic Spanish paella, therefore, is the Valencian paella. 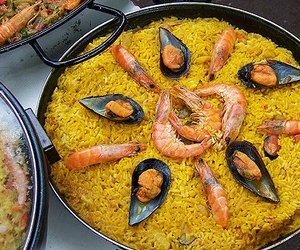 However most Spaniards who aren’t Valencians, and of course the vast majority of foreigners who think of paellas, have an image in their minds of the typical seafood paella. 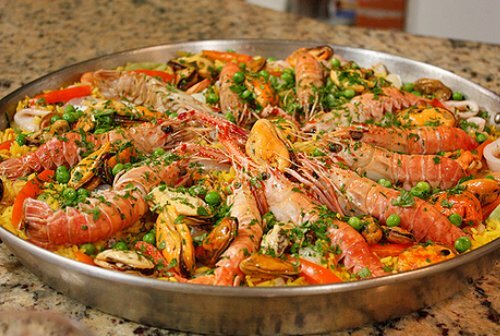 This is a derivation of Valencian paella and is very popular, especially in Andalusia in southern Spain, which is made with a similar base, but using varied seafood as main ingredients: prawns, mussels, clams, squid, etc. In addition to the seafood paella and the paella valenciana made with chicken and rabbit, there are plenty of paella recipes: mixed paella, vegetable paella, black rice paella, etc. But for being the most popular and for its exquisite taste, the most logical thing is to start with the recipe of the Spanish seafood paella. So let's go with that one! 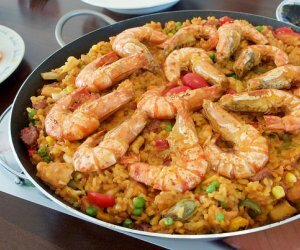 The authentic paella valenciana is made with meat, but among all paella recipes, the most desired in the United States is this seafood paella. To make the seafood paella delicious, it’s best to make home-made broth. How? Very easy, you just have to put an onion, a leek and a carrot with a few pieces of fish, heads and skins of prawns and salt in a pan, cover with water, and let everything cook for 30 minutes, allowing the steam to escape from time to time. Then strain it, and any broth you don’t use for the paella, you can freeze. After making the fish broth, clean the squid inside and out, and cut into rings. Then, chop the peppers and garlic cloves, and the tomatoes. Open the mussels in a casserole dish with water. Once the ingredients of the seafood paella are ready, start by frying the squid, and 2 minutes later pour in the chopped garlic, peppers and tomato. When it has reduced, throw in the rice. You now need two minutes on high heat, then add the fish stock and the saffron. Then you’ll leave the paella 5 minutes on high heat, and then turn it down to the minimum and simmer. After 15 minutes place the langostinos in the paella along with the crayfish and the mussels with half shells, in addition to the clams and peas. Add a little parsley, and after 5 more minutes, the seafood paella and vegetables will be ready. Before bringing the seafood paella to the table, let it rest for about 5 minutes off heat, covered with a clean cloth. In addition, the paella is usually decorated with pieces of lemon cut into quarters. 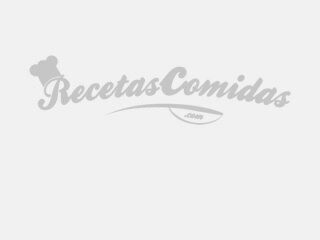 If you want to save time in the preparation of this paella recipe, but at the same time you want to respect the essence of this typical Spanish recipe, you can use a precooked fish stock. The distinctive feature of all paellas compared to other rice recipes is the type of rice that’s used. Above all, you can’t use long grain or basmati rice! The authentic rice for paella used in Valencia, Spain, and recommended by paella specialists, is bomba rice, a type of round rice with the capacity to absorb liquids better, which is usually at its ideal point after 20 to 30 minutes of cooking. If you can’t find bomba rice, you can also make authentic paella using any other type of round rice. Other details about the ingredients of all paella recipes that are truly deserving of the name of Spanish paellas are: the importance of using saffron as a natural dye. Don’t use artificial yellow dye. And whenever possible, use Spanish olive oil. As for the paella recipe, it’s very important to obtain a seafood rice in which the rice is loose, and never soggy. A soggy paella is considered almost a "sin" in Spain, hence the importance of measuring the right amount of broth with respect to the rice used. If you make your Spanish paella recipe following all these tips, you’re guaranteed a winner!